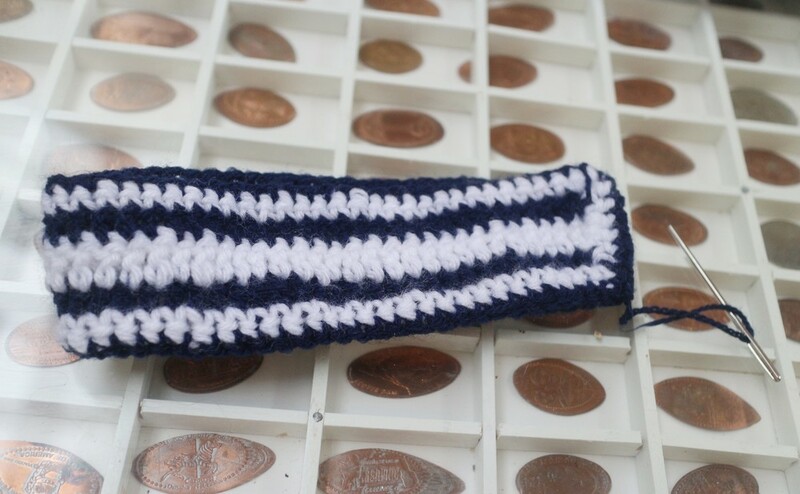 Cute crochet sailor bow belt - ahoy there quick weekend make! Ahoy sailor girls! Navigate the seven seas in style with a simple but adorable crochet bow belt. 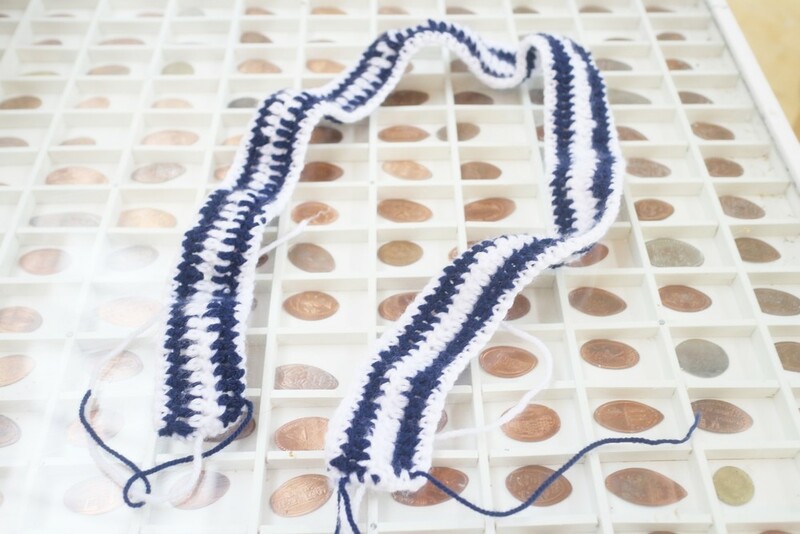 To make the belt, using the blue yarn, chain a length long enough to fit around your waist plus a couple of inches. Row 1: DC in each chain. Tie off. Row 2: Change to white yarn, chain 1, dc in each chain. Tie off. Row 3: Change to blue yarn, chain 1, dc in each chain. Tie off. Row 4: Using white yarn, sc in each chain around the entire belt. Tie off. To make the bow, using the white yarn, chain 60. Tie off. Row 1: Change to blue yarn, chain1, DC in each chain. Tie off. Row 4: Change to white yarn, chain 1, sc in each chain. Tie off. Row 5: Using blue yarn, sc in each chain around the entire belt. Tie off leaving a long tail. Stitch together the two ends of the bow with a yarn needle using the tail you left. Using blue yarn, chain 20. Row 1: DC in each stitch. Rows 2 ­4: Chain 1, DC in each stitch. Cast off leaving a long tail. Using the tail of the bow loop, stitch the top and bottom of the loop on to the front of the belt at one end. Slip the bow through the bow loop and stitch in place. Row 1 ­ 4: chain 1, sc in each stitch. Cast off. Stitch the two belt loops behind the bow, on the back of the belt, one at the very edge and one a few inches in. Slip the other end of the belt through the belt loop and your bow belt is ready to wear! Well... by now you all probably know just how much we love a good crafternoon and whether we master a new skill or tie ourselves up in yarn, we always have a great time trying something new. There is one thing, however, that we have been meaning to attempt for a very long time indeed... lino printing! 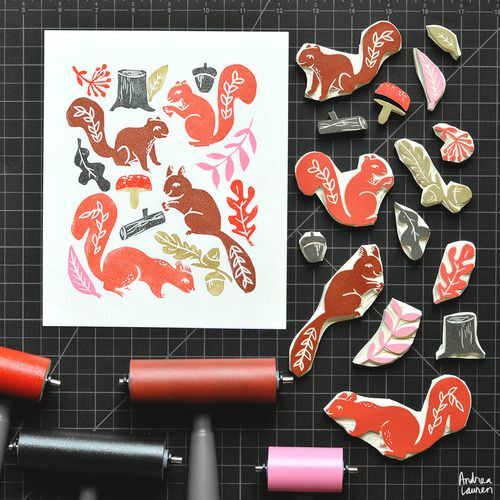 These incredible pieces have all been created by the fabulous Andrea Lauren and though, of course, we couldn't hope to ever be this incredibly talented, we are certainly using her as inspiration, especially as her subjects are so cute and akin to our taste here at Caboodle! With a decision made to plump for a simple rabbit design, we sat down and began! To start, we took a medium-sized piece of lino and a regular ballpoint pen. This would be how we would get our idea onto the print block. So far, so good! Gathering some pace, we got our rabbit design finalised and onto the block without too many problems. We even felt super confident and added some little sparkles! So far, so awesome! We are feeling great and really enjoying ourselves... could this FINALLY be the craft that we are naturally good at? Ok, so we have the design and we have selected our fine point cutter to go round the outside of the bunny to start marking the areas to be raised and those which needed to be sliced away to make a nice clean print at the end. This is where it got tricky! The secret is to really take your time and be meticulous! We realised that the stars were way too ambitious for our first attempt, so decided to cut them out but may have been a little too keen and accidentally cut into our finger! Please, please be careful if you intend to try this craft as the cutting blades are super sharp and though it looks small, this cut hurt A LOT! Gore aside... look how marvellously the design is coming along! Slow and steady really was the key here, despite our subject! As we got into the groove (please excuse that AWFUL linocut pun), we found this to be super relaxing and watching the design start to pop and come alive felt really exiting. In fact, we got a little cutter-happy in our enjoyment and cut through to the hessian backing of the lino a couple of times. This won't affect our print, but almost made a super hole in our dotty rug! The top print is our first go, when we were being stingy with the ink and the bottom is our second, when we were a little more confident. Plenty more practice needed, but for our first try, we have to admit that we are really pleased with how this turned out! Hector (as we have decided to call him) will now forever grace our office inspiration board to serve as a permanent reminder that we can and should try new things, because you never know... you might love them! We are now planning our next piece; something simple, but effective and it is really exciting us! It also takes the sting out of not quite being able to get the hang of crochet for Amy, despite numerous attempts! Have a go and tag us in your attempts with #caboodlemagazine or #caboodlegirlgang. We'd love to see them, we really would and we may pop them on our Instagram page! We bought our lino blocks, cutter and ink roller from www.artstore.co.uk but you can pick up all the supplies cheaply from lots of fab places online. Here is a fun and easy tutorial for our giant paper flowers that featured in our SS15 cover shoot! The flowers are great for weddings and parties, as well as interiors and photography props. They are quick and simple to make so are great to craft with little ones too! Share your finished flowers with us on Instagram and tag us in @caboodlemagazine. We can't wait to see your finished blooms! Take the cardboard tube, this will be your stem! Wrap in green tissue paper securing with tape as you go and tucking in the ends. Next take a sheet of tissue for the leaf, a contrasting green is lovely! Fold in half lengthways and cut a moon shape, so when opened up it looks like a leaf. Place on your floristry wire, one straight piece down the fold, then bend t wires into v shapes for the veins. Tape down the wires all the way along. Tape the leaf onto the middle of the stalk by one end, being careful not to rip the leaf. Next we start on the petals, take 5 sheets of tissue in whatever colour you like, fold in half, then fold in half again. Repeat with more sheets of tissue paper in complementary colours, whatever tickles your fancy! Cut a semi circle shape at one end of each piece of folded tissue and make each one a slightly different length for the different petals. You can also experiment with spiky shaped petals by cutting the ends into a point rather than rounded. Take the shortest petals and separate into individual sheets of tissue, one by one wrap around the top of the stem securing with tape and scrunching in at the bottom as you go. Fluff out the tissue as it grows so you get the petal effect. Repeat with the medium sized petals. And then with the larger petals. For monster sized flowers, cut some extra large petals by stacking up sheets and cutting an M shape at the top, whilst tapering the other end in slightly so they look like this. Keep adding these shaped petals until the dream size has been reached! Once you are happy with the size of your flower then wrap a few extra layers of tape around the base of the petals to make sure it is very securely attached to the stem. Take a contrasting colour of tissue for the centre of your flower, fold in half lengthways, then fold in half again and slowly roll and scrunch up the tissue. Glue into the middle of your flower and fluff out all the petals as required. Et Voila!! Repeat until you have a whole army of gorgeous flowers for whatever you require!